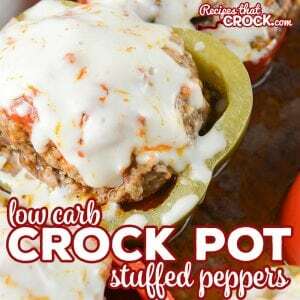 Crock Pot Stuffed Peppers (Low Carb) - Recipes That Crock! Are you looking for a low carb alternative to Stuffed Peppers? 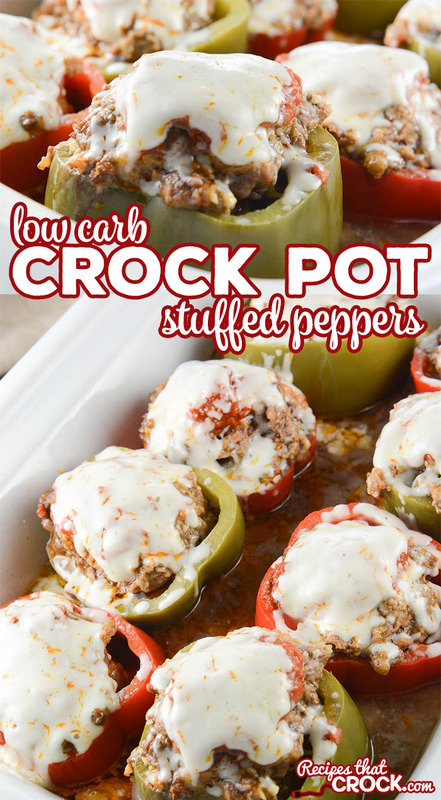 This incredible low carb version of Crock Pot Stuffed Peppers is so good no one will ever miss the carbs! I am super excited to share this recipe for Crock Pot Stuffed Peppers with you because a reader asked me a while back to come up with a stuffed pepper that didn’t include rice and I decided to take it a step further and try to lower the carb count as much as I could. So with a little trick, we cut the carbs of the peppers literally in half 😉 and with the filling base coming from one of my all time favorite meatball recipes, we have an excellent low carb (and rice free) version of Crock Pot Stuffed Peppers… and you guys… I like it even better than traditional stuffed peppers… I am telling ya, that meatball recipe is totally ah-mazing and it does wonders in these stuffed peppers! This recipe is super easy. The most difficult part is cutting the peppers and scooping out the seeds. You will want to cut the peppers in half (see video), cut out the stem from the tops and flip both the bottoms and tops with the the large openings facing up in our Casserole Crock (or 6 quart slow cooker). Then whip up a batch of our Meatball Parmesan Recipe and fill each pepper with the meat mixture. Top with additional sauce and cook on high for 3-4 hours or until the meat reaches 165 on a meat thermometer. Top with mozzarella cheese and let the cheese melt before serving. 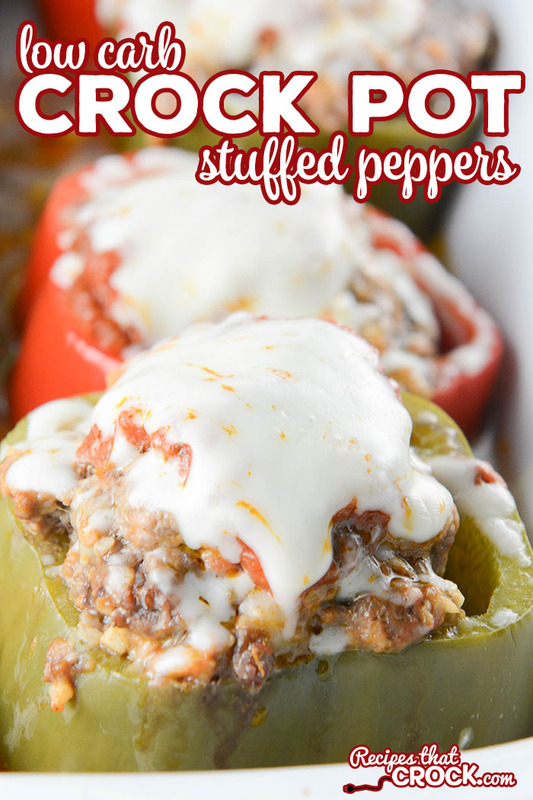 We are using our Crock Pot Meatball Parmesan Recipe as the filling for these Stuffed Peppers. If you would like to make a half batch of the peppers, you could turn the other half of the filling into our meatballs or even our Crock Pot Meatloaf Parmesan. 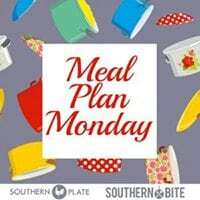 We used our Casserole Crock Pot for this recipe (and our Mini Casserole Crock for the half batch in the video) but you can use a 6 quart slow cooker, it just may be a bit snug. We like to use meat thermometers like this one so we can leave it in while cooking to ensure it gets to the temperature we need. When choosing your peppers, choose tall skinny peppers to make fitting them in the slow cooker easier. Instead of cutting the tops off your peppers like you do in traditional stuffed peppers, cut the pepper halfway down the pepper, creating "two peppers" to stuff instead of just one. On the "tops" peppers, use a paring knife to carefully cut out the stem. (It will be okay that this pepper will have a hole in what will become the bottom.) On both the tops and bottoms, scoop out all seeds and white parts with a spoon. Place each pepper (we've turned 4 into 8) in a casserole crock or large 6-8 slow cooker with the large openings facing up. In a bowl, mix together beef, parm, eggs, 1/2 cup of sauce, salt, pepper, garlic, onion and pizza seasoning until blended well. Fill each pepper with meat mixture and top with a tablespoon of remaining sauce. Cook on high for 3-4 hours until beef reaches at least 165 with a meat thermometer and then top with cheese and cook until melted. Can this cook on low or will the peppers get too soft from the longer cook time? I haven’t tried it but I know other recipes cook stuffed peppers on low, so while they may be softer, my guess is they will still hold up. Let me know how it goes if you try it. I made this tonight! I put it on low before I left for work at 7:30am and turned it off around 5:15pm when I returned home. Although the peppers were very cooked and did not have crunch, they were DELICIOUS! I served this with green beans and garlic breadsticks to my husband. We used 93/7 lean beef. He’s a bit pickier, but had no complaints 🙂 Thank you for a tasty, healthy recipe! If I want to add a little brown rice should it be pre cooked? Hi Susan- Without testing I would safe the safest route would to use cooked rice. Enjoy!